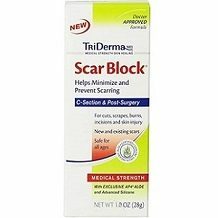 Scar Block is the focus of our product review in this article. The maker’s of this product claim that it can reduce and improve the overall appearance of new scars, while decreasing older damaged fibrous tissue. The manufacturer also claims that the product can protect the skin against future breakdown and deterioration. Dimethicone, a silicone-based polymer used to coat and hydrate the outer layer of the skin. Cyclomethicone is a chemical compound which is generally included as a sealant in skin care products, as its molecules are larger than pores. Silica, a mineral compound that acts as an abrasive anti-caking agent. Aloe barbadensis, aloe leaf extract which has been used to improve damaged skin, swelling, pain, and signs of scarring. This product is free from parabens, sulfates, and fragrances. The product lacks methylsulfonylmethane which can be beneficial in treating skin issues. According to the suggested usage instructions, for best results, apply this gel generously to the affected area twice daily. Ideally, you should try to use this cream as soon as possible following injury or surgery to prevent scar tissue forming. No specific warnings or side effects are mentioned. Consult with your healthcare provider before beginning use. In theory you can purchase this skin and scar care gel from the manufacturer’s website for $17.99. However, currently, the product is out of stock. There are no incentives for new customers nor discounts for bulk purchases. Shipping is free if you spend over $10. There is a 30 day return policy on this product. The company says it will either replace, exchange or refund your purchase. It only applies to closed, unused containers of cream however. The pluses to this cream are its ingredients and relatively cheap price when compared with competitor brands. Shipping is free if you spend over $10. It is free from: fragrance, parabens, cortisone, steroids, animal cruelty, sulfates, mineral oil, petrolatum, and phthalates. There is a 30 day return policy on this product. However, there were a number of disappointing aspects to this product. Currently, the product is out of stock and unavailable for purchase from the company website. In terms of ingredients, Scar Block contains several chemical ingredients which is somewhat concerning andmay make this cream more allergenic for some users. The product lacks methylsulfonylmethane which can be beneficial in treating skin issues. The 30 day return policy is too short and doesn’t allow you to return an opened container of cream. There are no incentives for new customers nor discounts for bulk purchases. In regard to dosage instructions, we are concerned that the manufacturer recommends that you try to use this cream as soon as possible following injury or surgery. We feel that this should be done with caution and only under the supervision of a physician. For all these reasons we suggest that you look elsewhere for a scar tissue cream. You should ideally look for one with a longer guarantee, that has bulk buying discounts, and a more natural list of ingredients.